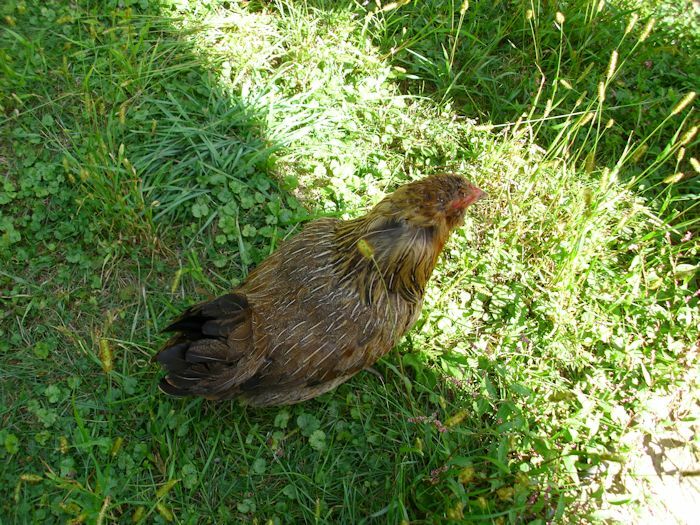 Some time ago I wrote a post entitled, “Dealing with Broody Chickens.” The chicken in question had decided to take to her nest box and stopped laying eggs. That’s only one sort of problem that can occur with hens. In some cases, a hen doesn’t become broody, she takes another course to perceived motherhood. In this case, Daisy decided to hide her eggs from view. Of course, we didn’t know that she had decided to hide her eggs until later. Because Daisy lays a particular egg color, a beautiful light blue, we had noticed we weren’t getting any eggs from her. However, we also hadn’t noticed any broody behavior. She was still out with the other chickens and didn’t have any of the other tendencies either. I had also noticed an odor around some of the plants at our house. Given that we live just a few feet from the woods and that we have livestock, the odor didn’t attract too much attention, but I should have paid more attention to this particular odor. Things got interesting one evening when we put the chickens up. Daisy was nowhere to be found. We searched and called, but no Daisy. Finally, we closed the coop up thinking that some wild animal had gotten our poor hen. Imagine our surprise the next morning when she turned up outside. That’s when I decided to follow her around a bit. She kept going over to the hostas and I finally saw something interesting. See if you can see it in this picture as well. Up near the top of the frame in the center of the picture you see a hole in the hosta covering. Normally the hostas won’t have a hole like that. 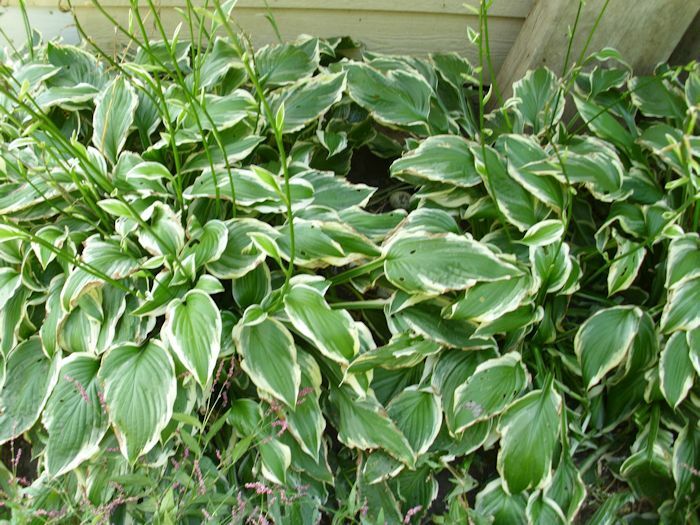 When you look very closely at the hole in the hostas, you see something. Taking a closer look, you can see what that something was. 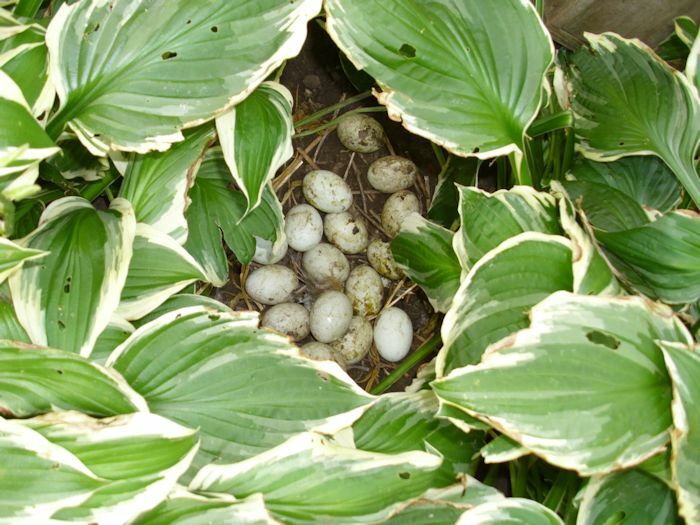 Daisy had built herself a nest in the hostas and laid 18 eggs there. She was busy setting on eggs that would never hatch because we have no roosters. Unfortunately, a good many of them were rotten by this time and cleaning them up was an unpleasant experience. This would lead many people to ask why we risk letting our chickens run free. There are many benefits in having chickens that can run around as they like. Chickens like to get out and hunt for bugs. They eat more bugs and grass than they eat anything else. The more bugs chickens eat, the less mash you feed them and the lower your feed costs. The resulting eggs have more nutrients. Chickens will also clean up food dropped by other animals, which reduces the food left for pest animals. This means that all of your animals live in a better environment and you have fewer worries about having to deal with pests later. In short, losing the 18 eggs was bothersome (not to mention expensive), but the benefits of letting Daisy run around are far greater. Let me know your thoughts about chickens running free at John@JohnMuellerBooks.com.